Fasten your seat belt. We're ready for an adventure! 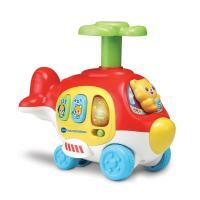 Take off into learning with the Push and Spin Helicopter by VTech! Press the top rotor blade to see the helicopter roll forward, which will support your baby in discovering cause and effect relationships. 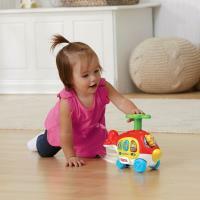 The 2 animal buttons are great for exploring as they trigger lights, catchy music and fun responses. The cool phrases, sounds and melodies encourage discovery and exploration and introduce your baby to animals, numbers, colours and letters. Includes 3 uplifting sing-along songs and 10 fun melodies which encourages language development.